There is no doubt that dusting and decluttering go hand in hand. 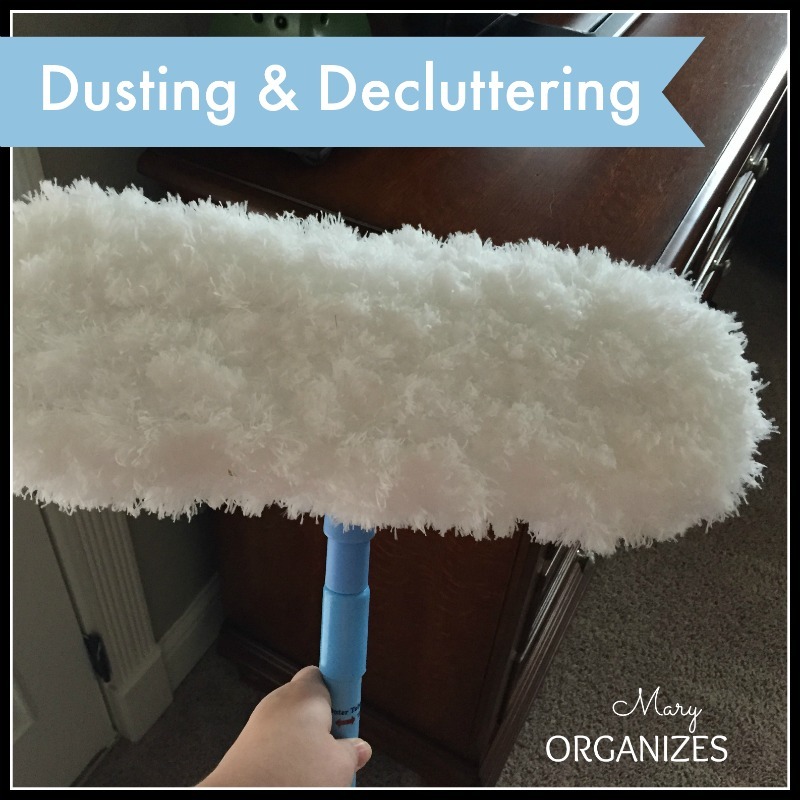 In my business as a professional organizer, I deal with a lot of dust! When you are decluttering/organizing backs of closets and rooms that don’t get a lot of attention, there is going to be a lot of dust. I am very allergic to dust, which is not the most convenient thing in my line of work. My husband used to tell me I needed to wear a mask when I organized for people so that I didn’t get sick, but I could never do that. I would never want to make my clients feel like I needed a hazmat suit just to help them organize their closet. 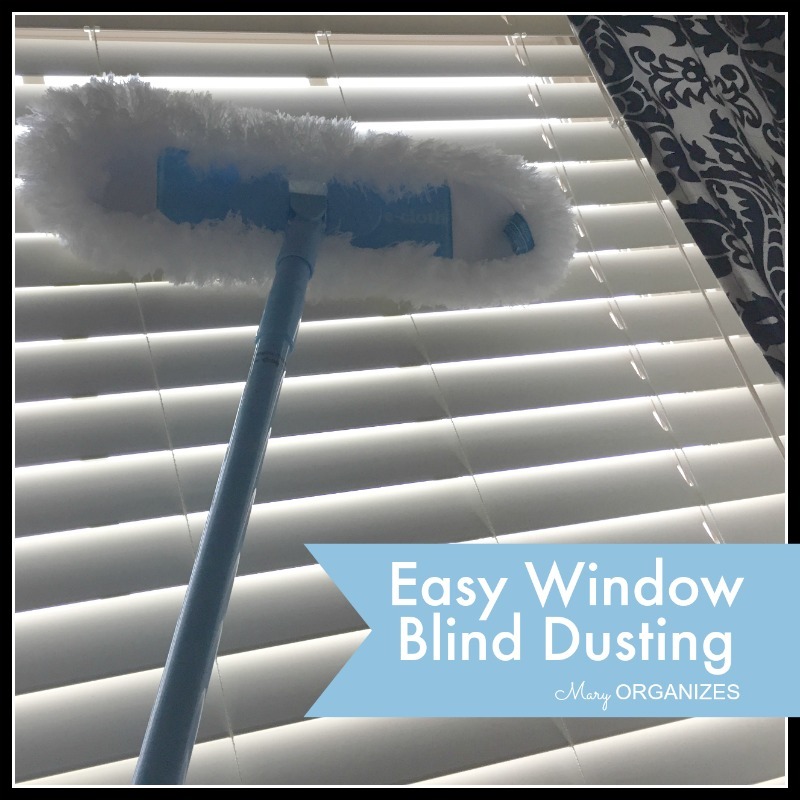 But dust is a very common issue when decluttering and organizing and I am always willing to try new ways of dusting, in case I find something that works better. 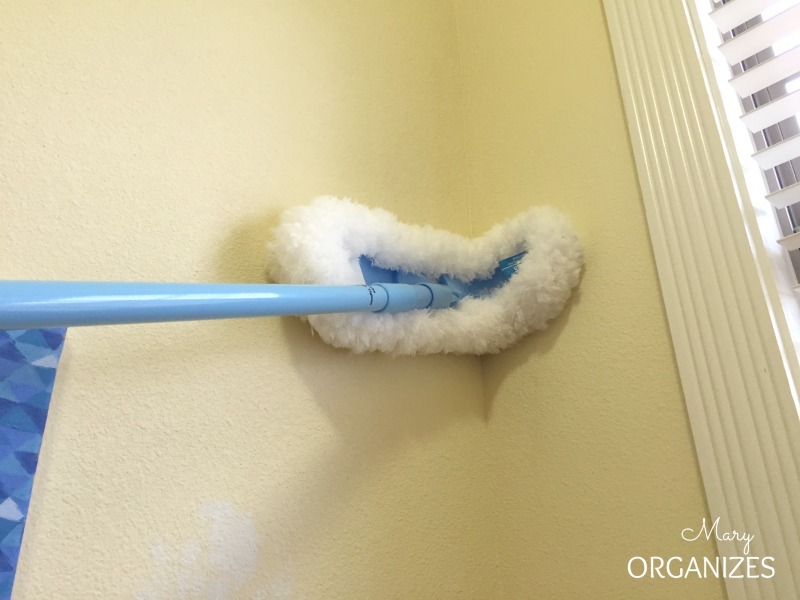 When e-cloth offered to let me try their Flexi-Edge Floor & Wall Duster, I only had to look at their website a few minute before I realized I would be crazy not to try it out. 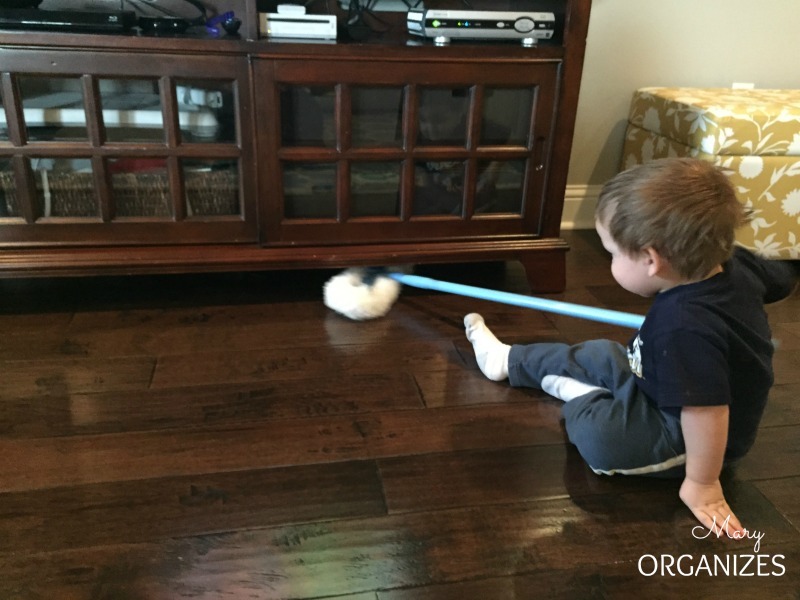 Their philosophy of chemical free cleaning is in line with my thoughts on chemicals. Do you know I’ve never used Bleach in my home since we moved in over 3 years ago? Not even in my laundry. Another important thing about e-cloth is that their dusters and mops are washable and re-usable, which is so much better for the environment AND my bank account. So now you may be wondering how I used and liked the Flexi-Edge Floor & Wall Duster? Let me show you. 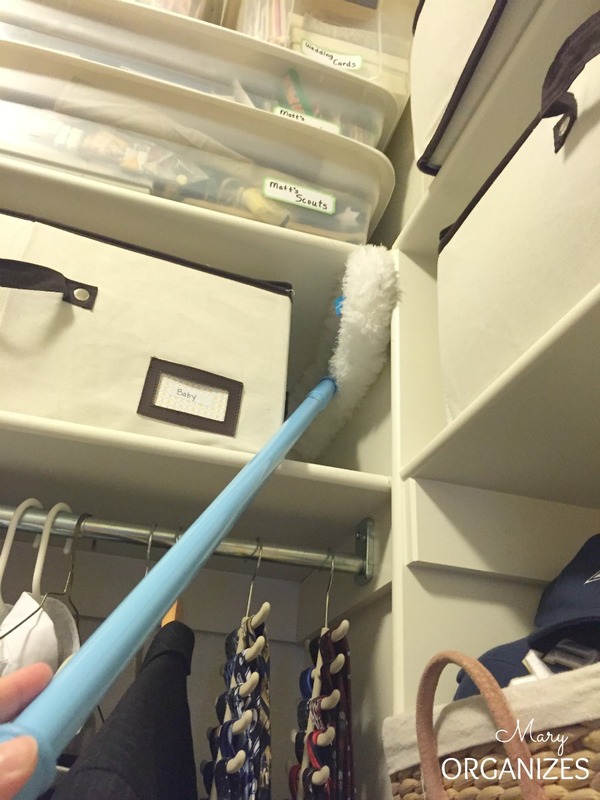 First of all, if you are decluttering your closet and pulling everything down from your shelves and hard to reach places, you might as well be dusting up there while the shelf is empty! I was able to dust the tall shelves and corners of my master bedroom closet easily, and without a single cloud of dust coming down on me. This is huge! Dust clouds are my nemesis, because if that dust falls in my eyes, my eyes will be red and swollen for at least 2 days. The fluffy white duster head is made in a special way and it traps all of that dust! Another thing is, I am very short. I just barely pass 5 feet tall. It is really difficult to dust tall things, so the long wand really helps with that. The Flexi-Edge of the duster was pretty awesome – the edges of the duster head actually bend. Corners are where the dust and cobwebs really like to gather, so a tool that can get in there is essential to actually getting rid of the dust. And getting rid of the dust is essential to keeping myself healthy and my eyes not red or puffy. Then I decided to go try dusting under my entertainment center in the living room, because that is always a difficult place to dust and the vacuum doesn’t reach to the back. This is also when my two year old decided it was his turn. Despite his “help”, it was still such a quick fix! And that is a very good thing, because the duster soon became a sword and I was pulled into combat. I want to give e-cloth a huge thank you for the opportunity to try this duster. I will be using this while I declutter every room in my house. And now I have a list of other e-cloth products I want to try next … like that big bendable dusting wand to clean underneath my fridge and washer/dryer. Yeah, that is happening! *This post is sponsored by e-cloth, but I assure you that all opinions are definitely my own. Thanks, Mary! E-cloth sounds like a great source for green cleaning products. Visited their site and signed up for their newsletter. That’s great! I love that green cleaning can still be excellent cleaning! I am 5’1 & live in an old house with high ceilings. The wood work around doors & windows collect dust & I have cobwebs out of reach places. Pain to get vacuum cleaner out every time I see something that needs a quick swipe. Just bought this product, which I know will be used constantly. I also got the bendable dusting wand to get under my washer & dryer that I just scrubbed clean. Thank you for sharing Mary. Woohoo!! Awesome! Tell me how you like the bendable dusting wand and if you think of any cool uses for it. I can’t wait to get mine! Mary, If you have used Swiffers dusters, what would be the difference, in your opinion? 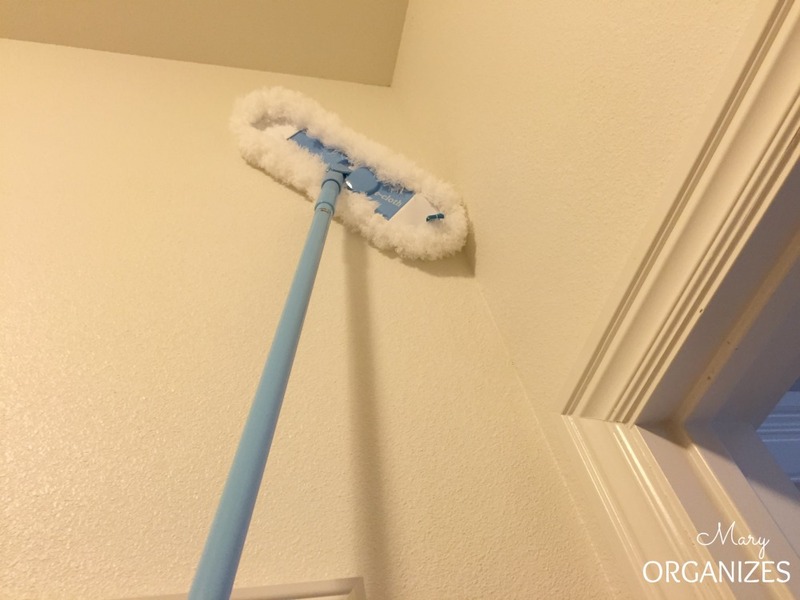 My daughter has a residential and commercial maid service and loves the Swiffers products. I and she may be interested in this product, as well. Thanks! I’ve used both products and there are lots of differences, but a huge one is that ecloths products are washable, which could prevent a lot of waste if you are going through a lot of disposable things. I was so impressed by how the duster captured the dust instead of wiping it off.